Plains, Georgia, plans on giving back to its resident globe-trotting former president by keeping him upbeat and entertained. 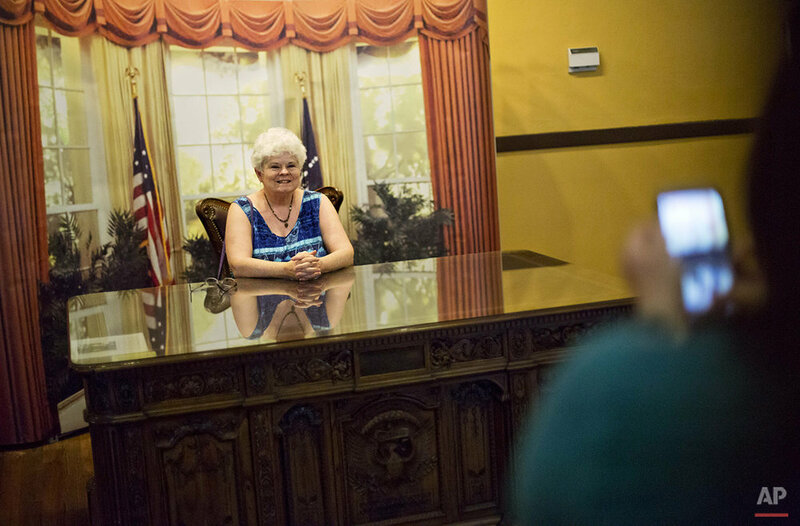 Jimmy Carter and his hometown have always been intertwined, from the day he announced he would run for president and an old train depot downtown became a local campaign office. He and his wife, Rosalynn, have always kept a home there, but the 90-year-old Carter intends to spend a lot more time in the tiny town as he's treated for cancer that has spread to his brain. The one-block business district specializes in Carter political memorabilia and peanut souvenirs. Visitors stop by after touring dozens of properties associated with the Nobel Peace Prize winner and his extended family, including Carter's boyhood farm and a gas station once run by his brother, Billy. The Carters live just down the street, in a 1961 home they built before he entered politics. It's now encircled by an iron fence with a guard checkpoint, and locals know Secret Service agents by name, along with their snack preferences. For Carter and former first lady Rosalynn Carter, Plains is a "haven" from their work in Atlanta and around the globe, he has said. They both were born and grew up in the area. They return here following each challenge, including his 1980 loss to Ronald Reagan and his first radiation treatment last Thursday. Residents determined to put a familiar grin on the 90-year-old Carter's face ordered 500 green and blue yard signs and fanned out to plant them in yards and along every route into Plains. Signs declaring "Jimmy Carter For Cancer Survivor," a slogan first shown in an editorial cartoon in The Atlanta Journal-Constitution, are in demand elsewhere now. It was a small gesture for the person who put Plains on the map and has continued to think about the town's best interests, said Jill Stuckey, a friend who hosts the Carters for dinner regularly. "They have always supported Plains, even down to (choosing) their burial place here in Plains," Stuckey, 54, said. "If in the future, you know, 20 years from now when President and Mrs. Carter have passed — or 30 years — they know that will be a draw for Plains." Plains residents, especially members of the church where Jimmy Carter taught Sunday school this weekend, are as protective of "Mr. Jimmy" and "Miss Rosalynn" as they are proud of their town's representatives. Jan Williams, a friend of the Carters, manages the crowds eager to see Carter teach at Maranatha Baptist Church. On Sunday, she warned hundreds seated on benches inside the church that they were not to offer a handshake when Carter sat for photos following the service. Her pre-lesson rules also had a new suggestion: Positive reinforcement. "Please don't say 'I'm so sorry you have cancer,'" she said. "He already knows he has it. Let's be positive." More than 700 people heard Carter deliver a familiar message this weekend: When your burden grows heavy, ask God for strength. The demand prompted a hastily organized second class at a nearby high school. Carter himself remains the biggest draw for Plains visitors. He plans to continue teaching Sunday school at the small Baptist church he and Rosalynn attend but church members say they aren't certain whether Carter can continue doing back-to-back classes. A.W. and Judy Hargett recently retired and decided to drive to Plains from their home in Florence, Alabama, on a hot and buggy Saturday. The couple joined a steady stream of visitors touring the family farm, where Carter helped in the family store and fields. Judy Hargett said she's wanted to attend one of Carter's Sunday School classes for years and didn't want to miss an opportunity. "I didn't know if the treatments would make him sick later and he wouldn't be able to teach," she said. "I have so much respect for President Carter. I still call him President." 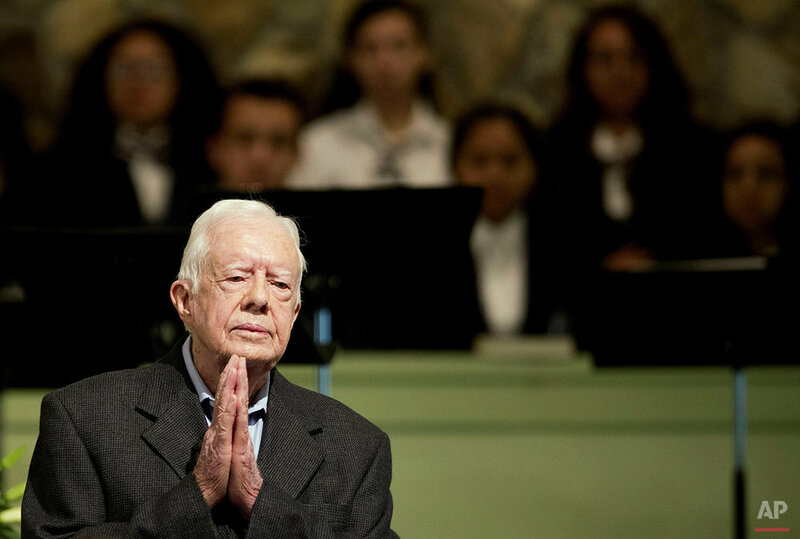 Text from the AP news story, Hometown, church mobilize to support Plains' Jimmy Carter, by Kathleen Foody.